Success is as unique as a fingerprint—and so is the journey to achieve it. The My Success campaign seeks to provide a community of support, stories and resources for lifelong learning. 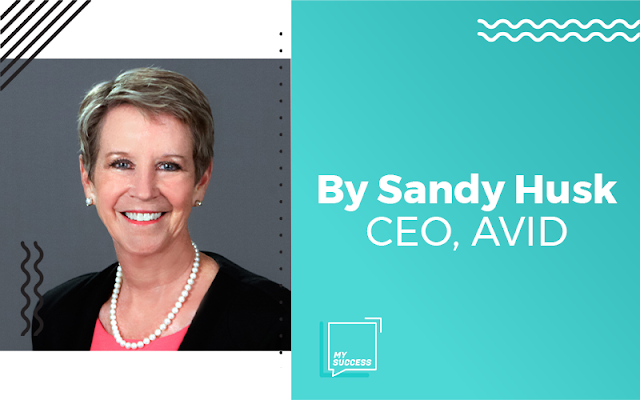 The following is a Q&A with AVID CEO Sandy Husk, in support of the My Success campaign. Learn more about how she defines success and how the song “Champion” keeps her motivated. What does education and workplace success mean to you? As a superintendent, I always pictured our students as happy learners prepared to tackle the school day, culminating in all of our students walking across that stage to receive their high school diplomas. I still hold that image in my mind and have added that all of our students should leave our schools with paths to meaningful post-secondary experiences including college, technical certifications, and the military. All children have the potential to succeed—it is our responsibility as educators to discover, believe in, and develop that potential in every child. How has working at your organization helped you define your own version of success? At AVID, I work every day with a diverse and motivated staff who is just as dedicated as I am to closing the equity gap in K-16 education. As a district leader, I was able to influence my local team. At AVID, along with all of my colleagues working to support the AVID mission, I can influence on a larger scale, which is extremely rewarding to me personally. I have been given a great opportunity to influence policy, coach, lead, and provide services to schools that are making a difference for educators, students, and communities. I heard a student in 8th grade speak at a recent AVID conference. He announced to a room filled with educators that AVID has influenced his future children by opening up opportunities in his life. Needless to say, that was simply amazing! Why do you think learning is so powerful in helping people achieve success? Education is the key to everything, isn't it? Personal satisfaction, career satisfaction, economic security—it all starts with education. As educators, we have a greater responsibility than ever before, because the shelf-life of workplace skills is shrinking. The jobs that will be held by today’s kindergartners don’t even exist yet. Because the workplace is so rapidly evolving, we must develop lifelong learners who are resilient and adaptable, with “soft skills,” such as critical thinking, communication and collaboration, to evolve successfully as well. These skills give people the confidence to problem-solve, persevere and have the grit to tackle the problems they face—large or small. What is your favorite quote or song that keeps you motivated to achieve success? "Champion" by Carrie Underwood and Ludacris. This song reminds me of how we encourage our educators and students to be resilient champions of their own lives. It’s so energetic and inspiring and reminds me that each of our students has the capacity to be a champion! It focuses me on the work we need to do on behalf of students who are underrepresented in higher education, and it also fills me with energy, because I am leading an organization that is proven to be making a difference for those populations. It fills me with excitement to see our AVID educators reach more and more students and have such a positive effect on the students’ vision of their future. And I feel a tremendous sense of urgency to increase the momentum. I truly want every student in the country to have the resources, support and self-esteem to achieve whatever they want to in their post-secondary life; whether this means attending college immediately following high school graduation, starting their career while saving to fund their college degree, or working part-time while receiving a technical certificate with a goal to complete college. Our educators, in the work they do every day, instill the confidence to succeed. “Champion” reminds me of this passion. What helps you when you hit a bump on your journey to success? My style is to ask a lot of questions and to listen, and then put together a plan. If the "bump" is internal to my organization, I also make sure my team knows of the plan. If everyone has clarity around the plan, I can lead from a place of consistency to further the mission. The result is that we get through this as a team. If the "bump" is personal, I reflect deeply on my plan, decide on my strategies, and then attack the plan with determination. Sounds like an AVID student, right? Who would you like to thank for helping you along your journey to success? Generous and wise mentors, colleagues, and friends, too numerous to name! Is there anything else you'd like to share to help others achieve education and workplace success? As a leader, it is important to communicate your vision well. I've always found it helpful to use my words to create a visual that others can internalize. For example, when I share my desire to make AVID ever more accessible, I ask my audience to visualize a crowd of students on a football field, divided into two groups. The smaller group has had AVID. Those students know they can achieve their dreams through determination and hard work. Then, on the other side of the field, visualize an even larger group of students who might be afraid to even dream—because they really don’t know where to begin or if they can even do it. Can you see it? One side of the field knows where they’re going and believes they can get there; the other side longs for the same confidence and skills their friends over there have. Then I ask my audience, whether staff or external partners, to think about what they can do to help the larger group join the college-ready students on the other side of the field. When it's told like that, people can see it, and they want those students to have the same opportunities. Getting others to share your passion for your mission is part of leadership. ACT recently committed $310,000 to help the Iowa City Community School District (ICCSD) implement AVID programming, in hopes of helping more students from the organization’s corporate hometown attain their story of success.